Home CDN , children , crafts , December , feature , holiday , holidays , homeschool , papercrafts , printables , US , worldwide December 6th - Freebies! -- Traditional celebrations of Saint Nicholas Day in Northern Europe included gifts left in children's shoes (the origin of our American Christmas stockings). Good children receive treats - candies, cookies, apples, and nuts, while naughty children receive switches or lumps of coal. Sometimes coins were left in the shoes, reminiscent of the life-saving dowries the saint provided. Today - especially in families of German extraction - children still put a shoe outside their bedroom doors on the eve of Saint Nicholas Day and expect to find candy and coins or small gifts in their shoe on December 6th. 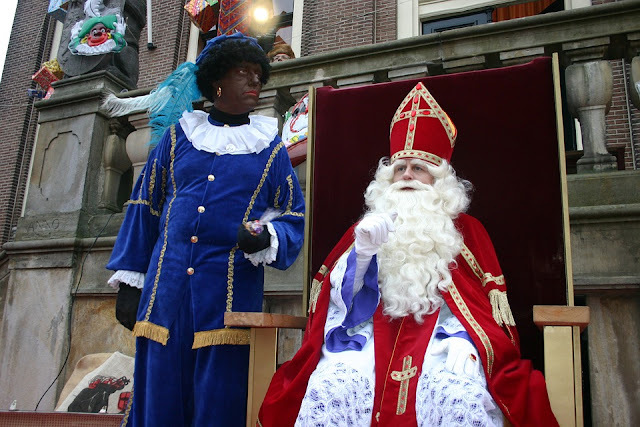 -- Van Amsterdam the baker was well known for his honesty as well as for his fine Saint Nicholas cookies. He always gave his customers exactly what they paid for -- not more and not less. So, he was not about to give in when a mysterious old woman comes to him on Saint Nicholas Day and insists a dozen is thirteen! The woman's curse puts an end to the baker's business, and he believes it would take Saint Nicholas to help him. But if he receives that help, will it be exactly what he imagined? Find out in this inspiring legend from Dutch colonial New York about the birth of an honored American custom. • Saint Nicholas: The Real Story -- Was there a real Santa Claus? To answer this question, host Mark Wilson, a distinguished historian, and archeologist travel not to the North Pole but to modern-day Turkey and Italy. There he uncovers clues leading to the truth about the man behind the legend. • PLAYMOBIL Christmas Parade Set -- Show off your holiday spirit with the Christmas Parade. Set includes three child figures, St. Nicholas figure, horse, holiday lanterns, and other accessories. Recommended for ages four to ten. - Gazpacho is a classic Spanish vegetable soup consumed mostly during the summer months because of its refreshingly cold qualities. This tasty dish combines the best of summer vegetables including tomatoes, cucumbers, peppers, and onions. - Celebrated on St. Nicholas Day, the patron saint of pawnbroking. Designed to acknowledge the valuable lending and retail services the pawnbroker provides his or her clientele. - The 13th Amendment to the Constitution was ratified, abolishing slavery in the US. Neither slavery nor involuntary servitude, save as a punishment for crime whereof the party shall have been duly convicted, shall exist within the United States, or any place subject to their jurisdiction. - More than 1,650 people were killed at Halifax in 1917 when the Norwegian ship Imo plowed into the French munitions ship Mont Blanc. Mont Blanc was loaded with 4,000 tons of TNT, 2,300 tons of picric acid, 61 tons of other explosives and a deck of highly flammable benzene, which ignited and touched off an explosion. In addition to those killed, 9,000 were injured. A tidal wave caused by the explosion washed much of the city out to sea. - Perhaps this day was created by young mothers teaching their children how to put their shoes on for the first time!? Put on your own shoes could also mean to walk your own path in life. - One day the kids with everything put their hats and mitts on the tree so the less fortunate could play. Some churches and organizations have mitten trees so you can donate mittens to those without.